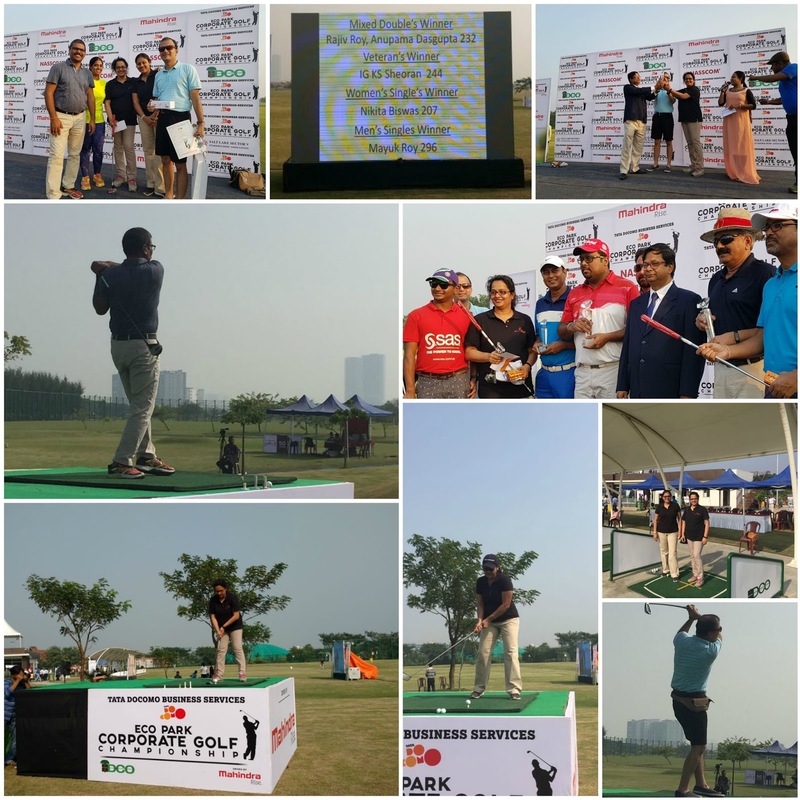 The city’s newest golf destination at Eco Park witnessed more than 200 amateurs from 150 corporates houses and a number of professional golfers on Saturday, 25th November. Be it beginners or professionals, schools students or senior private company executives or retired personnels, everyone made a day out of playing at the 12-bay golf driving range inaugurated by NKDA in June this year. The event was the Eco Park Corporate Golf Championship and leading corporates including the likes of Cognizant, TCS, IBM, Tata Steel, Yes Bank, Mahindra, IXIA, Infinity, SREI, Accenture, HSBC, SIDDHA, Atos, ONGC, Deloitte, Web Spiders, Tractors India, Godrej, Mjunction and Capgemini participated. eRevMax was represented by a 4-member team of Udai Singh Solanki, Anupama DasGupta, Rajib Roy and Neha Ginoria. Mayukh Ray, Hotel General Manager, Ganga Kutir, Bengal Ambuja and Nikita Biswas of Tollygunge Club won the Men’s and Women’s Singles category with a mammoth drive of 296 yards and 207 yards respectively. The pair of Rajib Roy and Anupama DasGupta representing eRevMax won the Mixed Doubles category, with a combined drive of 232 yards, while the Veterans(above 50) category was won by the former IG of the Coast Guard, KS Sheoran with a 244 yard drive. It was a very positive ambience and good competitive spirit among all participants.